In Arkansas, the requirements for divorce vary depending on how you were married. The state recognizes both standard marriages and what are known as covenant marriages. In a covenant marriage a couple takes an oath of understanding that marriage is a lifelong commitment. Nonetheless, a divorce may still be granted for covenant marriages after completion of counseling and a court-ordered separation. Understanding the requirements for filing a divorce for regular and covenant marriages in Arkansas will help ensure that you avoid unnecessary delays in the divorce process. To file for divorce in Arkansas, you must first meet the state's residency requirement. Arkansas has different residency requirements depending on whether your marriage was a regular or covenant marriage. For regular marriages, residency is established if either you or your spouse lived in the state for the previous 60 days leading up to filing, with the added requirement that you continue to live in the state for a total of at least three months by the time the divorce is finalized. For covenant marriages, residency is established if you or your spouse are currently living in Arkansas and the grounds for divorce occurred in the state. If the grounds occurred out of state, residency is established if your or your spouse lived in the state before the grounds occurred and one spouse is currently living in the state at the time of filing. Once residency is established, the next step is to file a complaint for divorce in the county in which you reside. If you are a nonresident, you should file in the county where your spouse resides. In the complaint, you must specify grounds for divorce. For regular marriages, Arkansas allows both fault and no-fault grounds for divorce. Fault grounds include adultery, incurable insanity and commission of a felony. You can also file under the no-fault grounds of living separate and apart from your spouse for 18 months. For covenant marriages, the same fault grounds are recognized, but the separation period for no-fault divorce is two years from the date of the judgment of separation, or two and a half years if you have minor children. After completing and filing the complaint, your spouse must be provided a copy of the document and personally notified of the divorce. This is known as service of process, which you may complete with the assistance of a sheriff or professional process server. Once your spouse has been served, he has 30 days to respond to the complaint in writing. After the response has been filed, or your spouse fails to respond within the time allowed by law, the divorce can move forward. Even if your spouse responds to the complaint immediately, no divorce in Arkansas can be granted until at least 30 days have passed since the date of filing. While you are waiting for the final divorce hearing, you may request temporary orders from the court for issues related to property division, spousal support, and child custody and support. You may also attempt to reach agreement with your spouse on these matters in advance of trial. If agreement is not possible, or you need to prove fault grounds for divorce, you may spend this time preparing for the divorce hearing. Preparation typically involves the parties exchanging financial information and securing witness testimony. At the final hearing, a judge will review any written agreements between you and your spouse and listen to the evidence presented in matters where you disagree. 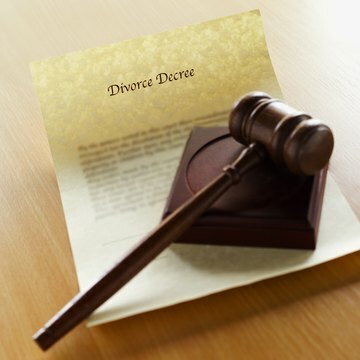 The court will then order a divorce decree, which will spell out each party's legal obligations, including support and custody issues, and division of property. The divorce will be considered final at that time.